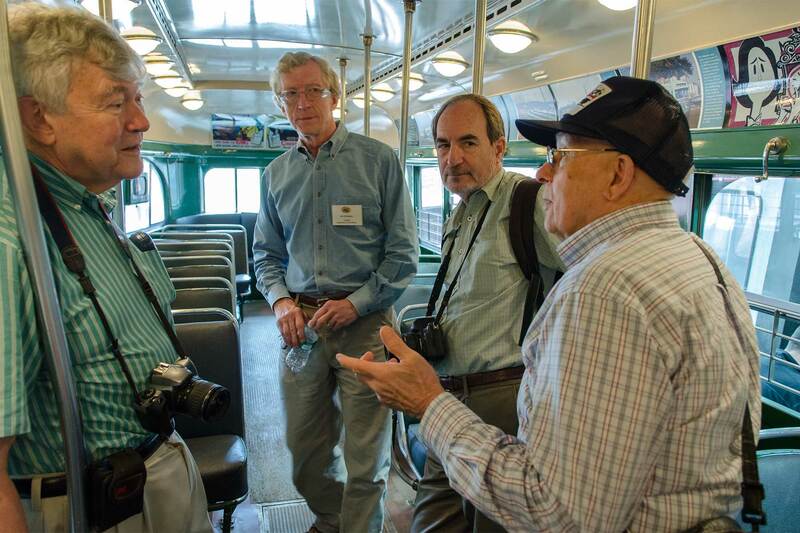 Frank discussing PCCs during the Seashore Trolley Museum day trip of the 2012 ERA Convention. 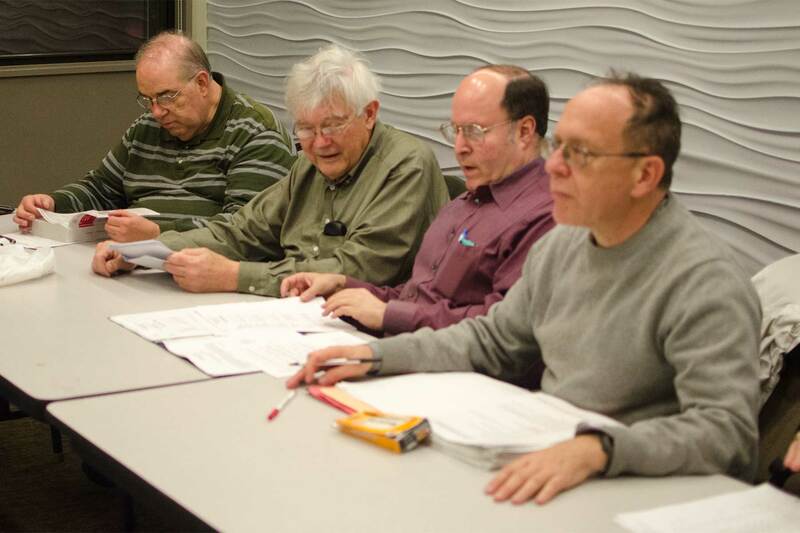 Board members John Pappas, ERA President Frank Miklos, Michael Glikin and Robert Newhouser at the 2011 Annual Meeting in the Seafarers & International House. ERA President Frank Miklos at the 2010 Annual Meeting. “Do we have a quorum yet?” ERA President Frank Miklos at the 2009 Annual Meeting. 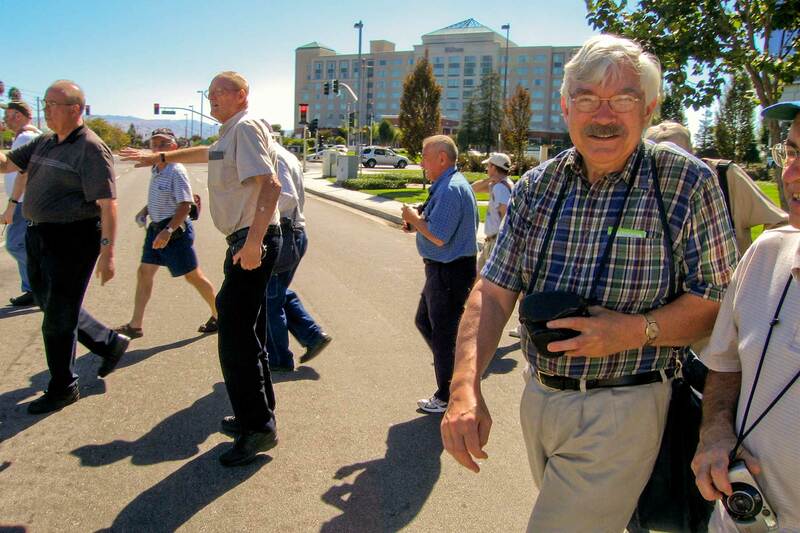 Frank returning to a chartered VTA Light Rail car after a photo stop at the Old Ironsides Station during the San Jose day trip of the 2004 ERA Convention. Frank S. Miklos, president of the Electric Railroaders’ Association for 18 years, died in Denver, Colorado on his return from this year’s ERA Convention on Saturday, June 1, 2013. He was 73 years old and suffered an apparent heart attack aboard his flight to Newark prior to its departure. I was one of Frank’s many friends, and ‘many’ may be an understatement. Thus, I’d like to say a few words about him. Frank was always interested in streetcars. As a child he would ask his parents to take him for rides on trolleys. Fortunately they were quite sympathetic and acceded to the boy’s wishes. He told me he relished every minute aboard the cars, and quite often, was quite willing to forgo the cake and milk provided by his relatives at their homes along various Public Service trolley lines so he could spend more time observing the streetcars. They say that ‘getting there is half the fun,’ but in Frank’s case it may have been most, if not all, of the fun. With his interest in trolleys he found out about the ERA, joined our organization and visited its offices on a notable occasion around 1963. I was there working on Headlights, and we immediately hit it off. In our conversation he indicated that he would like to work in the transit industry and I suggested he go see a friend of mine, Jim Whittaker, at the Tri-State Transportation Commission in New York City, one of the first regional planning groups. He was hired immediately as the management saw that this intelligent, enthusiastic and knowledgeable young man would be perfect for their organization. The rest is history. He continued on with the New York City Transit Authority in 1969, then the Bureau of Rail Operations of New Jersey’s State Department of Transportation, and in 1980 became one of New Jersey Transit’s first employees. 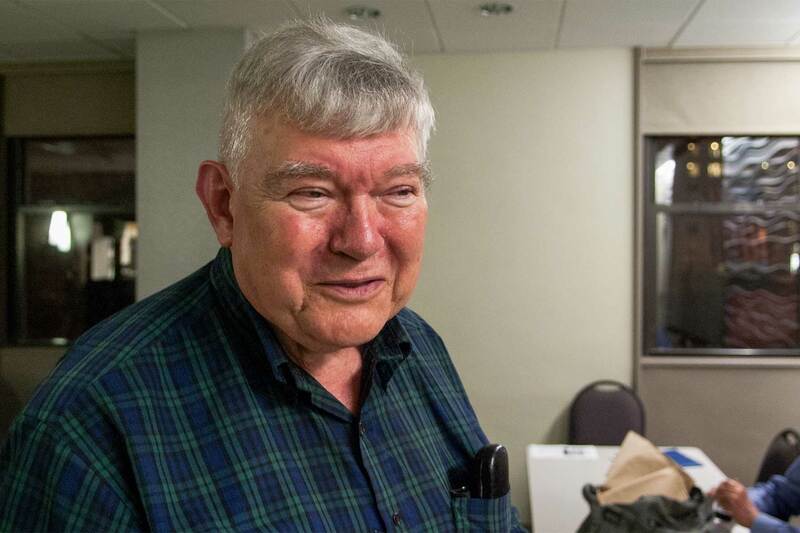 NJT lost a faithful and competent member of its staff when Frank retired in 2003, after some 40 years in a vocation that he truly enjoyed, which is something that few folks can achieve: earning a living from a labor of love. Frank was a inveterate international traveler. We journeyed together on many trips, and even roomed together when my wife was not along. One occasion was in Milan on July 14, 1977. I know the date very well because Frank was carrying one of those old transistor radios and was listening to Paul Harvey on an American Armed Forces Radio station when he heard that there was another major blackout in New York City. We laughed about it and said we were lucky to be away from places with problems. The next morning we both woke up about the same time. Frank said, “uh-oh, listen.” I listened and said “uh-oh” too. It was quiet. A few Milan trolley lines operated right by our window and their music (some would say noise) lulled us to sleep the previous evening. Now there was only silence. A one-day strike of all urban transit it Italy had started. We were crushed, as we now had to “waste” a day and do something other than ride streetcars, like visit museums. Anyway, Frank got a real kick out of traveling, especially in Europe, because here in the U. S. he (and all of us) were witnessing the gradual replacement of our beloved trolley cars with buses, which was the opposite of what the cities in some countries, such as Germany and Holland, were doing. During the 1960s and 70s, while he observed this abomination, he never lost the faith — his hope, spirit and passion for electric traction was as high as ever. Thus he was especially pleased when what we call the “Light Rail Revolution” began to take root in North America, starting in 1978. No longer was there doom and gloom as the trend had been reversed, and new streetcar lines (although sometimes under the name ‘light rail’) began to take shape. He was excited about projects in San Diego, Portland, Los Angeles, Minneapolis, Charlotte and many other cities, and felt vindicated as the technology he always KNEW was better, finally was being recognized and accepted all over. However, it wasn’t a total victory. He was very frustrated with light rail’s slow progress in New Jersey and, as a result, joined the light rail panel of the New Jersey Association of Railroad Passengers where he worked tirelessly with Phil Craig, Rose Heck and me to persuade politicians and New Jersey Transit executives to expand this mode of travel. As a result of his (and our) efforts, New Jersey Transit recently announced that they will be extending the Hudson-Bergen Light Rail Line for some 10 miles from Union City to Englewood Hospital. That was something he took great pride in. And Frank had a lot of other reasons to be proud, as well. For example, his work in the preservation, restoration and rehabilitation of historic streetcars was notable, especially on Public Service car 2651. He was a great leader, and served as an officer and president of many other groups, including the North Jersey Chapter of the NRHS and was a founding member of the North Jersey Electric Railway Historical Society. As president of the ERA, Frank was very concerned that the members would receive communications from the organization, including news of electric traction developments. 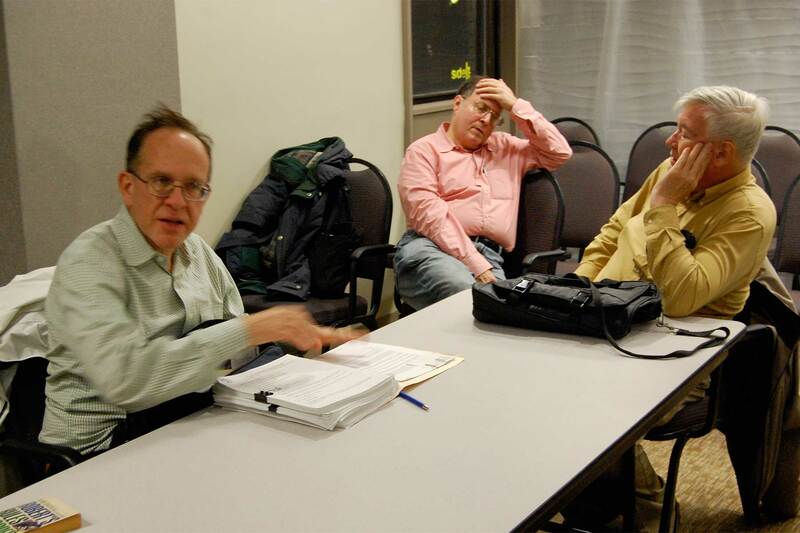 Thus, during a hiatus in the publication of Headlights, he began the Headlights News Journal and worked tirelessly to get the news out to ERA members. His interests were eclectic, involving all aspects of the hobby. Frank and I also shared a love for Old Time Radio, and we went to the Friends of Old Time Radio Convention together for almost a quarter of a century. And as part of that avocation, he appeared live on WBAI in reenactments of various radio dramas as part of the Gotham Players. If you knew Frank, you’d know about his great a sense of humor. He was especially fond of the comedy team of Bob & Ray, and the great story teller, Jean Sheppard. In later years, his sister Jeanne accompanied Frank to many railfan and radio events, and she will certainly miss him, as we all will. In summary, Frank was a fine, responsible and generous friend, always available to lend his hand to any project. We throw around the word, ‘good.’ But its classic use is appropriate in this context: Frank was a Good Man. We will all miss him. Electric Railroaders’ Assoc., Inc. is a non-profit educational organization consisting of people from all walks of life interested in the history and progress of electric railways. The ERA was founded August 15, 1934 by Edwin Jay (E.J.) Quinby, 1894–1981. More about E.J. Quinby (much more) can be found in Arthur Goldwag’s 2011 article Commander Edwin J. Quinby and the Great Streetcar Conspiracy. Benefits of ERA membership include regional trips, monthly meetings, annual conventions, biennial international tours, monthly Bulletin newsletters and a yearly Headlights magazine.